There’s a cliché that says certain singers are so soulful they can ‘sing the phone book’ and make it a profoundly moving experience. 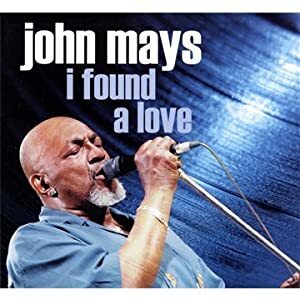 John Mays is one of those singers, a man who seemingly oozes soul, and his debut, “I Found A Love,” is an utterly superb recording. Mays isn’t exactly a stranger to the studio – as lead vocalist for Toronto-based Fathead, he’s fronted the band through numerous recordings. But I Found A Love, released on his 70th birthday, is the first under his own name. Chock full of deep soul chestnuts, it’s a magnificent collection that combines exquisitely refined, tasteful performances from a crack band with the rafter-shaking power and passion of Mays’ gritty vocals. Most of the players are old friends of Mays, with many of his Fathead cohorts on board, including guitarist Teddy Leonard and Al Lerman on sax and harmonica. Lance Anderson is on keys, while guests include the late Willie ‘Big Eyes’ Smith and Bob Stroger, both mainstays of Muddy Waters’ last truly great band. Instrumental accompaniment is impeccable, with the emphasis on the feel of the song rather than blazing displays of virtuosity. Lerman, equally adept on both harp and horn, gets in some fine, understated solos, but for the most part the band is content to remain in support mode, putting the emphasis where it belongs – on Mays’ sweet, soulful voice. The title track, a hit for The Falcons (featuring a young Wilson Pickett) kicks things off. It’s a risky move – a more upbeat opening is the norm, but Mays pulls it off through the sheer intensity of his performance. The tempo may be slow but there’s no shortage of passion, and Mays proves himself every bit Pickett’s equal when it comes to righteous testifying. Arthur Conley’s “People Sure Act Funny” gets a funky arrangement that picks up the pace, but it’s back to balladry for a bit of a left-field choice – John Lennon’s “Jealous Guy,” before Mays’ gospel roots get a workout with the traditional “Jesus On The Mainline.” This one’s a highlight, with every element blending into a superlative whole; Leonard’s acoustic guitar, Lerman’s harmonica, and atmospheric accordion and banjo from Denis Keldie, with superb backing vocals from an impromptu quartet that sounds as though they’ve been singing gospel standards all their lives. And so it goes; a funky strut here (“Think,” originally a hit for the Five Royales), bluesy workouts (“Groove Me,” “Have Mercy Baby”), and lots more testifying (Deadric Malone’s deep-soul classic, “You’re Gonna Make Me Cry,” and “Can I Change My Mind,” a huge hit for Tyrone Davis), before things wrap up with a raucous rendition of the Rev. Thomas A. Dorsey’s “Standing By The Bedside Of A Neighbor” that quite simply soars with sheer musical exuberance and unfettered joy. Mays is a seasoned performer with a genuinely charismatic stage presence. Rarely does that come across so well on disc, but this recording captures the man in all his sweaty, soulful glory – he may not have written the tunes, but he makes them all his own with personality aplenty and passionate, spine-tingling performances. As a musical genre, soul has become somewhat muddied over the years, with slick bedroom come-ons the current currency; this, though, is what it’s really all about, a glimpse into the soul of an exceptionally talented man willing to share his joy and pain in song, where that joy and that pain are real and tangible. The difference, in short, between manufactured and real – I Found A Love is as real, and as good, as it gets. Get it!